In the Middle East and North Africa (MENA), the Solidarity Center supports democratic unions and civil society organizations as they defend the human right to freedom of association, promote worker equality and raise awareness of the global economic context in which they labor. 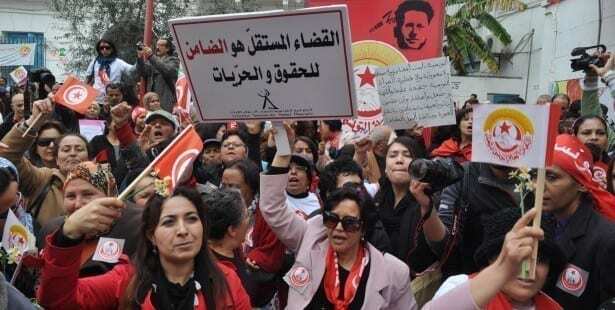 The rich history of union activism in much of the MENA region goes back to the 1920s, when labor movements formed the working-class base of the struggle against colonial authorities. Today, global economic and political dynamics are eroding the universal human rights that democratic trade unions defend. Government efforts to liberalize come at a great cost: the erosion of worker rights and economic fairness. While in some MENA countries, cumbersome laws facilitate government intervention in trade union operations, generally excluding or discriminating against certain workers based upon political ideology, gender, national status or job class. The Solidarity Center partners with many regional trade unions and nongovernmental organizations (NGOs) to improve domestic labor law and its implementation, and to give workers a voice in shaping the economic and political development of their countries. Regionwide programs strengthen workers’ political and economic rights by promoting rule of law, defending freedom of association, building capacity and internal union democracy, and encouraging trade union organizing. Dedicated to advancing workers’ human rights, each trade union and civil society organization in the MENA region grows stronger through alliances with one other and within the global labor movement. This strategic approach is central to the Solidarity Center’s work in MENA.